SIAYA COUNTY, KENYA—Looking at the ground to conceal her disappointment, Doda, an impoverished villager in Saiya County, Kenya, accepted the surplus Kappa Kappa Gamma bid day shirt given to her by volunteers from the University of North Carolina’s Panhellenic Council earlier this week. The Panhellenic Council’s philanthropic shirt distribution was started in 2011 to make good use of the roughly 2000 extra shirts produced by each year’s sorority bid day celebration. 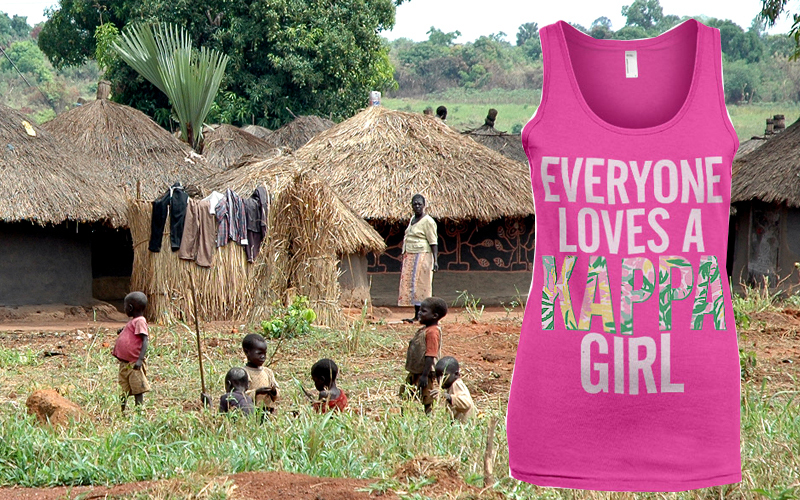 This year, five young women representing the Panhellenic Council landed in a rural Kenyan village with several large crates of shirts. As they opened the boxes, villagers began to grab the assorted garments inside. “No, no, no, wait, no,” said Grace Malter, the council’s Vice President of Philanthropy, snatching shirts from those who had already grabbed them and motioning for the crowd to stay back. The Panhellenic Council’s delegates isolated the village’s women for the next week, determining whom would receive which shirts through a series of events and interviews. Malter said that she and the other volunteers judged would-be shirt recipients on character, personality, and the “cuteness” of their traditional Kanga body wraps. “We asked them some questions that were serious and some that were fun,” Malter said. “If I were to raid your closet, what’s the one thing you would never let me steal?” she was overheard asking one woman during an interview. Julia Anderson, another Panhellenic representative on the trip, said that, by the end of the week, it was clear which shirt would be right for each woman. Holding the Kappa Kappa Gamma shirt she was ultimately presented, Doda was among those who were somewhat let down. Asked, since the process of shirt distribution was so similar to sorority rush, whether recipients would be considered members of the sororities represented by their respective shirts, Malter hesitated.